'16 and CEO of Abcombi Biosciences. Abcombi Biosciences was nurtured by a strong support system for UB startups. Some of the more popular resources and programs are listed below along with a listing of entrepreneurship courses offered at UB. Visit UB's Office of the Vice President for Research and Economic Development (OVPRED) to find out more. 43North is the world’s largest business idea competition and part of New York Governor Andrew Cuomo’s Buffalo Billion initiative, which is driving new economic opportunities throughout Buffalo and Western New York. 43North gives out $5 million in cash prizes each year to some of the best and brightest entrepreneurs and startups from around the globe. 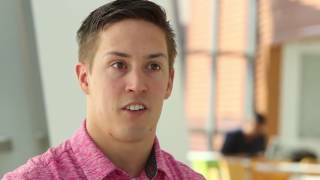 Blackstone LaunchPad at UB is a campus-based entrepreneurship program designed to support and mentor students, staff and alumni, regardless of major, experience or discipline. The office is located in Room 220 of the Student Union on UB's North Campus. Buffalo Startup Weekend is a global network of passionate leaders and entrepreneurs on a mission to inspire, educate, and empower individuals, teams and communities. Come share ideas, form teams, and launch startups. It is held as a kick-off event to 43North week in late October. The Center for Entrepreneurial Leadership (CEL) recognizes and supports the power of entrepreneurship to launch human potential, inspire innovation, produce jobs and generate wealth. Advancing entrepreneurship is vital to invigorating the university, the surrounding community and the greater Western New York economy. The CEL provides an individualized and interactive education in entrepreneurship. Designed by entrepreneurs and for entrepreneurs, the CEL is based on proven principles, centered on best and next practices and backed by the thought leadership of the UB School of Management. Dig is a 6,000 square foot coworking space located on the first floor of the Innovation Center, designed to help entrepreneurs of all types to form, refine, and launch their business ideas by providing them with education, mentoring, and access to broad business networks. It is a project of the BNMC, Inc., which is a self-sustaining enterprise driving social change in our community. It is located at 640 Ellicott St., in Buffalo, NY. During one week each November, Global Entrepreneurship Week inspires people everywhere through local, national and global activities designed to help them explore their potential as self-starters and innovators. These activities, from large-scale competitions and events to intimate networking gatherings, connect participants to potential collaborators, mentors and even investors—introducing them to new possibilities and exciting opportunities. The UB Center for Entrepreneurial Leadership organizes all the activities during this week. The Henry A. Panasci Jr. Technology Entrepreneurship Competition was created by the UB School of Management and the UB Office of Science, Technology Transfer and Economic Outreach. Funded with a $1 million endowment from the late Henry A. Panasci Jr., the program brings together UB students from science, technology, business and other disciplines to maximize their potential and create viable businesses in Western New York. Pre-Seed Workshop is a community event where teams build companies over the course of two and a half days. Organizers bring together experts in the community (technical, legal, business, finance, etc.) to determine the viability of new start-up concepts, potentially being spun-out of universities and federal labs, with a focus on commercializing hard-science technologies. Highly-skilled professionals are pre-assigned to work with academic researchers that have patented inventions. The talent on each team is "balanced" to simulate a real start-up company. Six to eight teams are created per workshop. During the workshop, the teams are led through a series of structured hands-on sessions where they investigate and transform potentially commercializable technologies into pre-seed stage companies. Teams leave the workshop with a thin commercialization plan for a new start-up. The Buffalo Student Sandbox is a summer accelerator for scalable, disruptive ventures led by college and graduate students. The nine week accelerator will select promising teams of student entrepreneurs, provide them with seed funding, stipends, and mentors as they compete for cash prizes at the end of the program. The mission of the Entrepreneurship Academy is to enhance the undergraduate experience at UB and harness students’ creative and innovative spirit. This Academy helps prepare undergraduate students for future business development and helps students understand the process that goes into taking an idea and turning it into a product. The University at Buffalo Office of Science, Technology Transfer, and Economic Outreach (STOR) facilitates the transfer of UB discoveries into enterprises that create value and provide products and services that benefit the public good. STOR collaborates with UB’s economic development focused organizations to foster partnerships between UB – New York’s major public research university – and the business community. The WNY Innovation Hot Spot (IHS) is a collaborative network of incubators and entrepreneurial service providers from across Western New York, working together to turn our region into a hotbed of entrepreneurial activity. Starting a business is never easy, but access to the right tools can make a difference. The IHS collaborators share best practices, networking, mentoring, educational, and financial resources to better assist incubator client companies. The WNY Student 2 Biz Challenge is a collaborative effort between the 21 colleges and universities of the Consortium and promotes entrepreneurship between student teams along six categories. Currently enrolled graduate and undergraduate students from Western New York colleges and universities are encouraged to submit business plans around a student-born innovation that is designed for a currently unmet need. Winning teams from each region are invited each year to pitch their venture to an external panel of investor judges at the New York Business Plan Competition.